On Oct 24th, 99 youth were arrested on Parliament Hill calling on Prime Minister Trudeau to reject the Kinder Morgan tar sands pipeline. Stand with these youth. Tell trudeau to reject Kinder morgan. It’s Climate 101 that meeting the commitments Canada made in Paris means keeping fossil fuels in the ground. That means rejecting the Kinder Morgan pipeline this December. Building a tar sands pipeline is one of the greatest threats to that future. That’s why we, along with dozens of other youth and students, are headed to Ottawa in late October to teach the Prime Minister the most basic lesson of climate science: climate leaders don’t build pipelines. Tar sands expansion isn’t just a pressing danger for the climate, it violates Indigenous rights and steamrolls over communities. Justin Trudeau promised to respect Indigenous rights, listen to communities and lead on climate action — he will fail to do all of this if he builds another tar sands pipeline. On October 24th, throngs of young people from all over the country will converge in Ottawa for a march and civil disobedience action. Emboldened by our passion, our hope and our frustration with politics-as-usual, we will partake in an unprecedented action to call on the Prime Minister and self-appointed Minister of Youth, to reject Kinder Morgan and commit to move away from pipelines and fossil fuels towards clean, renewable and just energy policy. We are taking this action because we know that during the 2015 election, young people turned out in unprecedented numbers. We know that youth turnout helped to elect Prime Minister Trudeau, and we know that young people across Canada want to see real climate action and respect for Indigenous rights — not more pipeline politics. We may inherit the impacts of climate change and fossil fuel expansion here in Canada, but around the world people are already feeling those impacts, losing their homes and losing their lives. It’s time for real leadership on climate, it’s time to move past pipelines. We hope you will join us. Mass Arrest on Parliament Hill During Protest. Approve the pipeline; lose our vote: millennials. Young activists cut their teeth with Ottawa arrests as they gear up for national pipeline fight. 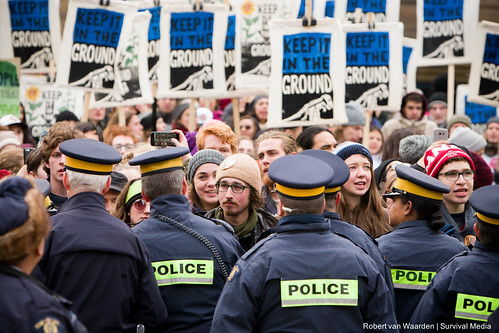 Canada: 99 detained at Protest Demanding End to Tar Sands Pipelines. See all photos from the action on flickr. To Prime Minister Trudeau, our wannabe climate leader I say: you need to do better. Like a teacher with a pupil, the youth who elected you see your potential. We see your potential, and we are disappointed by your results. Also like teachers, we will take the time to patiently explain to you what you must do in order to pass this all important test. A test which, if you pass, will see this nation, and your government on the right side of history. On October 24th, youth from across this land will gather in Ottawa to help you understand what true climate leadership is. I’ll be one of them. Students don’t want selfies. They want a liveable future.